“I applaud all of you for coming this evening. The Church is at the forefront of a battle. 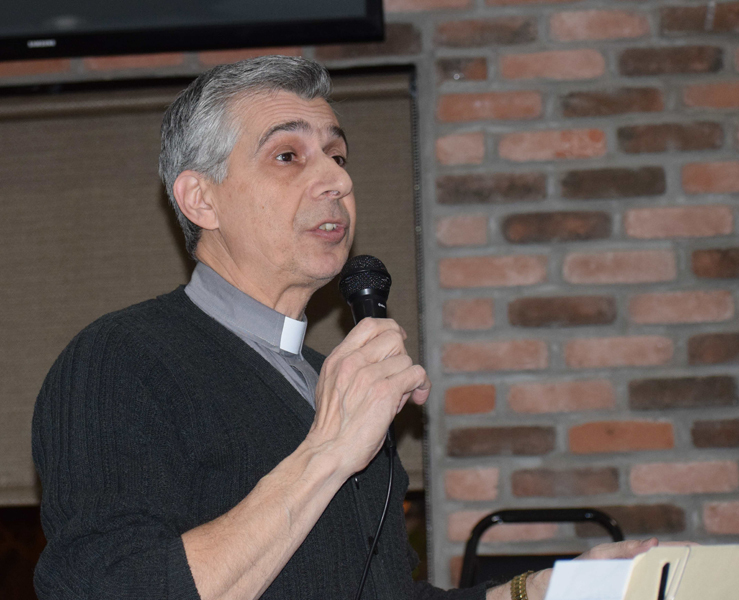 You are a very pivotal generation,” said Deacon Anthony Bellitto, assigned to St. Stanislaus, Lansdale, March 11 to young adults during Theology on Tap. Deacon Bellitto led the discussion “Why Stay in the Church?” at Hops at the Paddock, Allentown, while young adults enjoyed food and drinks in the casual atmosphere. He began the discussion by pointing out that, as a deacon, his role differs from a priest for many reasons that include having a foot in the secular world and the ability to bring the Gospel into the family and workplace. “Also, a priest doesn’t have to suffer the pain of an adult child leaving the faith like I am experiencing. It’s a heartache and I have a front row seat,” he said. “So how can we stem that tide?” asked Deacon Bellitto. “The Catholic Church did more good for more people in the world yesterday than any other organization. But we don’t hear about that in the news. The charitable works of the Catholic Church are ongoing. The Catholic Church is going to do the same thing tomorrow. But we don’t hear about that,” he said. Calling the clergy abuse crisis the “elephant in the room,” Deacon Bellitto said the crisis has propelled people to leave the Church along with another reason. “I really believe the No. 1 reason people leave the Church is because they have lost the love story,” he said. Encouraging the young adults to look at the Church on a different level, Deacon Bellitto said marriage can be viewed as a “bum deal” when they contemplate taking out the trash, changing diapers, checking in with their spouse and other restrictions. “If you just look at marriage on another level – all that stuff is nonsense. You would do those things 1,000 times for your spouse. When you lose the love story – everything falls apart,” he said. Reminding the young adults that Christianity is the only story of God searching for man and not man searching for God, he told them that God loves them and wants their hearts. “Part of the reason why people leave is because we live in a skeptical culture and hostility toward the Church. Is it because God doesn’t do enough to show us he loves us? Or has he done so much that we don’t buy it?” asked Deacon Bellitto. In addition, Deacon Bellitto said the culture is in “a crisis of belief” and stressed that belief matters when determining their standing before God. “There is a truth outside of you. There is no such thing as ‘my truth’ and ‘your truth.’ The relativist view is that your life is meant to be lived for you. The Christianity view is that life is meant to be lived for others,” he said. “It comes down to whether or not the person in the mirror is your authority or not. Does Christ have authority in your life? That is the position of humility. Or is it the position of arrogance that you are your authority?” he asked. Deacon Bellitto said he often hears that Mass is “too repetitive” as another reason people sway from the Church. “My wife wakes up and kisses me and tells me she loves me every day. It’s very repetitive – but it is not boring,” he said. “It’s never enough and we need to say that with Christ,” he said. Deacon Anthony Bellitto, assigned to St. Stanislaus, Lansdale, leads the discussion “Why Stay in the Church” during Theology on Tap. 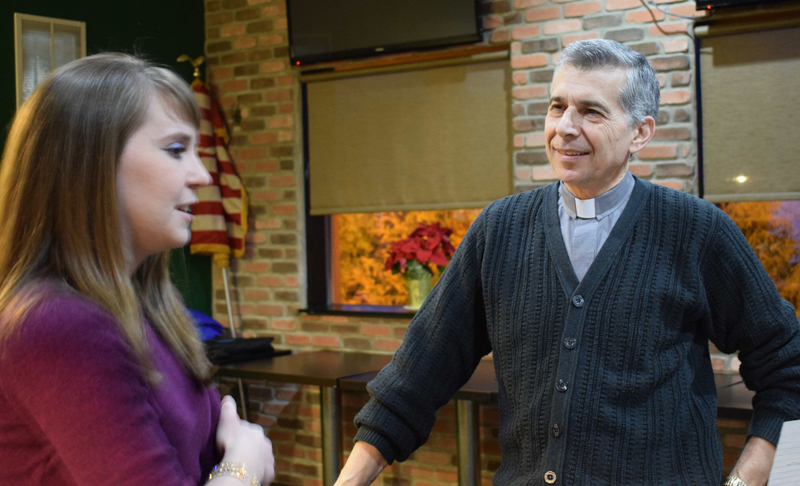 Alexa Smith, left, director of the Office of Youth, Young Adult and Family Ministry, chats with Deacon Bellitto during Theology on Tap at the Hops at the Paddock, Allentown.